Come celebrate San Marino’s talented and dedicated Girl Scouts as we recognize and honor girls who have achieved their Bronze, Silver, or Gold Awards. Delicious Tea, Tea Sandwiches, Fruit, Cakes and Cookies, Fun Souvenir, Photo Booth, Craft Making, And More! 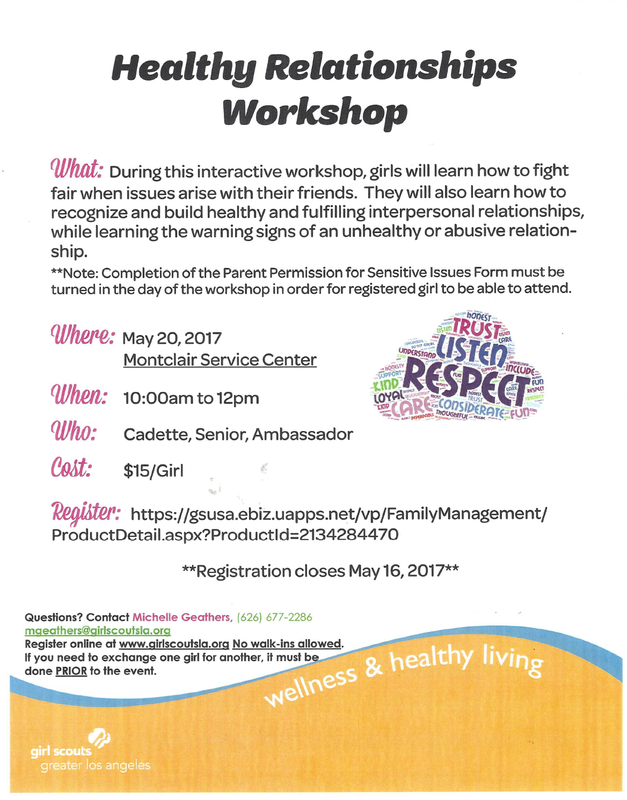 4.30.17.-revised-mothers-day-tea-flyer.pdfFor more information or to register, click here. Girl Scouts of all ages are invited to represent Girl Scouts at the annual Fourth of July celebration in San Marino. We need Girl Scouts in uniform to walk in the Parade and carry banners, as well as uniformed Girl Scouts to participate in the Flag Ceremony at Lacy Park to kick off of the fireworks display. All Girl Scouts who participate will receive an event patch, 2 free wristbands, and recognition by the City of San Marino. For information on the Parade, click here. For information on the Flag Presentation, click here. Join us for another fabulous year of fun at Lacy Park. This year’s theme will focus on adventure, teamwork, & the celebration of the American flag! 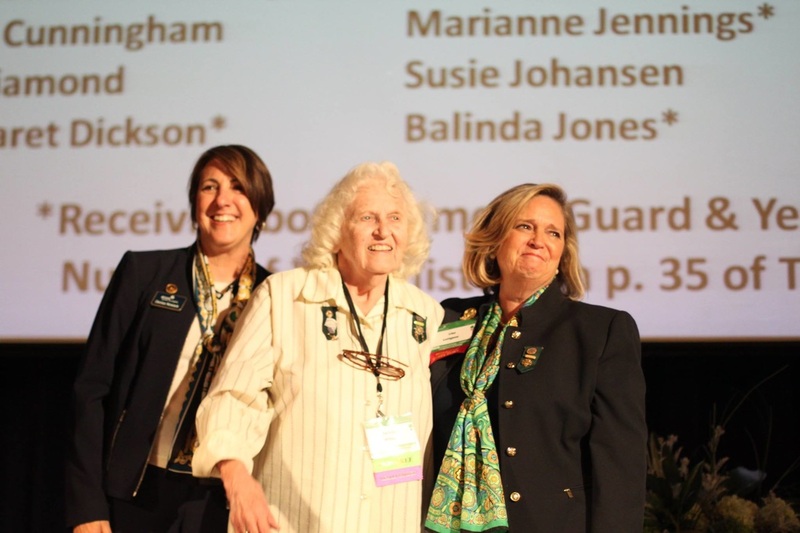 Girls will enjoy Girl Scout games and traditions from around the world. Older Girl Staff is SOLD OUT! ​Learn about the benefits of starting a new troop or adding new girls. Click here for the Parent Information Meeting Flyer Template. 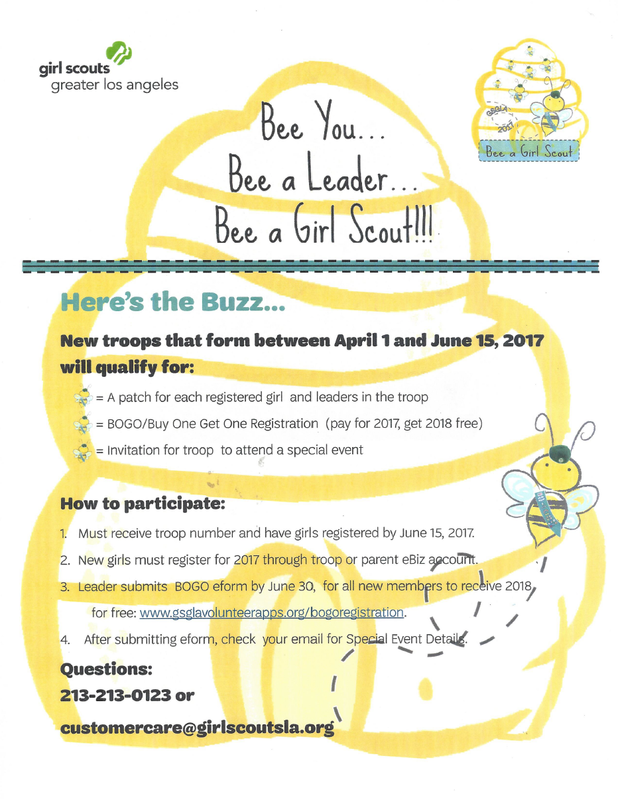 Register early for the 2017 - 2018 Girl Scout year. 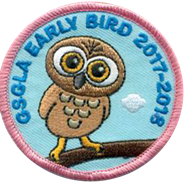 Do it between April 1 and June 15 to earn the Early Bird patch. Click here. If you need help, please contact Dawn Miller at outpostlady@earthlink.net or GSGLA at 213-213-0123 or by e-mail at helpdesk@girlscoutsla.org. We are here to help you. For more information on the Benefits of Early Renewal, click here. Are you hungry for a great service project? TWO OUT OF EVERY FIVE CHILDREN IN LOS ANGELES COUNTY ARE AT RISK OF HUNGER. 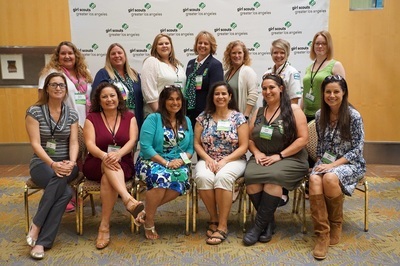 Help Girl Scouts of Greater Los Angeles fight hunger! 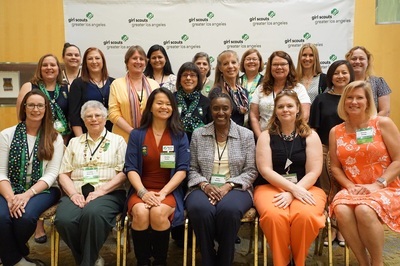 Fight hunger in your community and earn the Feed Your Neighbor patch by completing activities that weave in the three keys of the Girl Scout Leadership Experience: Discover, Connect, and Take Action. It all culminates with a month long food drive. GSGLA is proud to have Ralphs/Food 4 Less as the preferred grocery partner of the 2017 Feed Your Neighbor Service Month. *Must submit evaluation within 2 weeks of program end date of April 29th. Patches subject to availability after April 29th. Scouts Day at the Renaissance Faire will be April 29/30 and they have a new program for older girls, as the Faire is managed entirely by women. 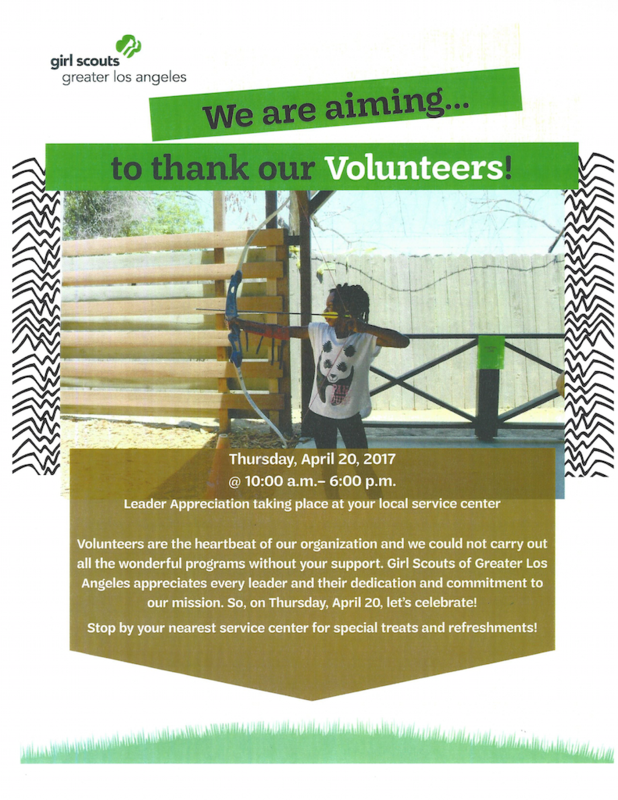 Volunteers, are you looking for a service project? Scouts, and the community. 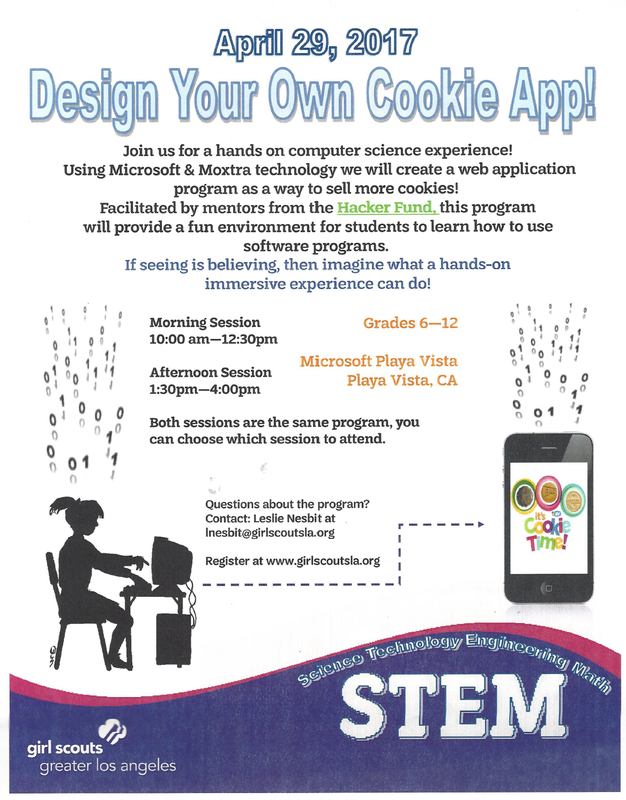 Hosted by Sydney Reisch from troop 01031. England, Ireland and Wales in summer 2017 or Japan in summer of 2018. Council trips are open to girls who are Cadette and older at the time of travel and a limited number of adults. girls meet their goals. We are very excited for you and want to help you get started. We would like to offer you a $50.00 Project Seed Money Donation. ​Click here for the Application form. 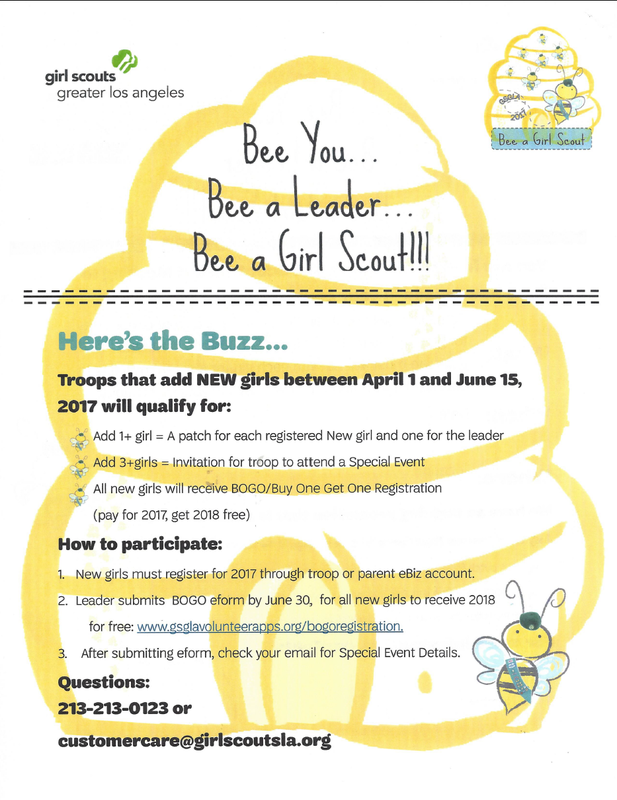 Only registered San Marino Service Unit Girl Scouts in Grades 6 through 12 are eligible for the Credits and drawings. Participate in the ceremony that is a Girl Scout tradition and represent Girl Scouts at community and sporting events. Have you always wished you knew the words to Girl Scout songs? As part of their Journey, Cadette Troop 3671 has made some videos to teach lyrics and hand movements to Girl Scout songs. Check out the Resources page to view Troop 3671's videos and more. 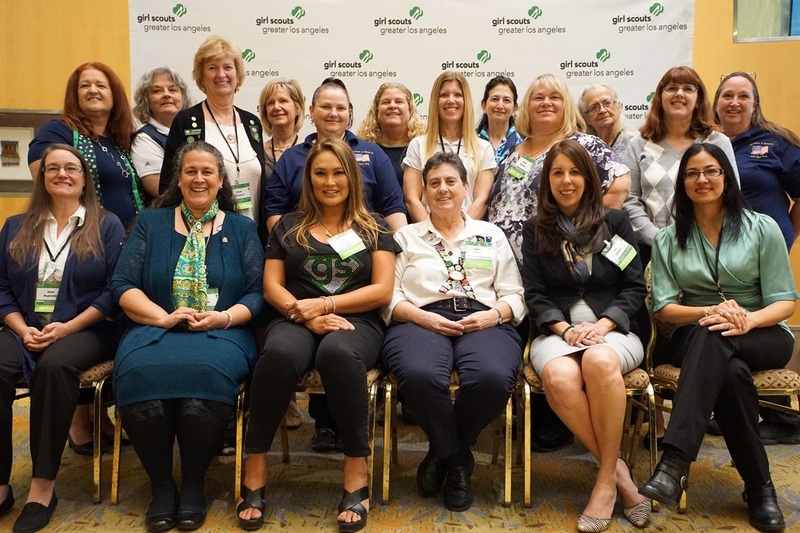 NASA recognizes Girl Scouts earning the prestigious Gold Award. To receive a certificate of recognition from NASA commemorating this distinguished achievement, the Scout Leader, parent(s), or legal guardian(s) needs to provide the following information. Please submit only one request, as duplicate requests are not honored. Full name of the award recipient. Full name and mailing address of the requester. 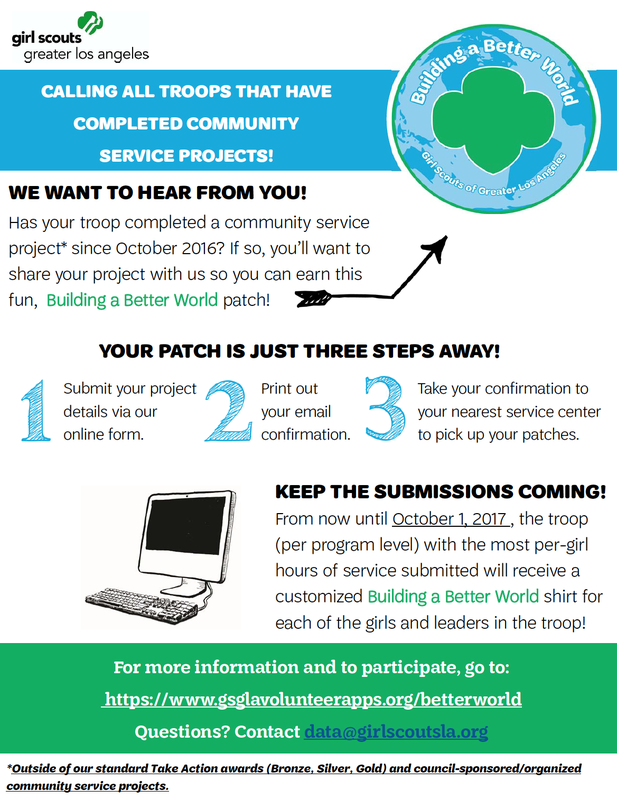 Or submit your request online now via our Girl Scout Award Form. See above to learn how Older Girls can participate in the Raffle. Global Travel Opportunities for 2016 and 2017 (aka Destinations) Click here. 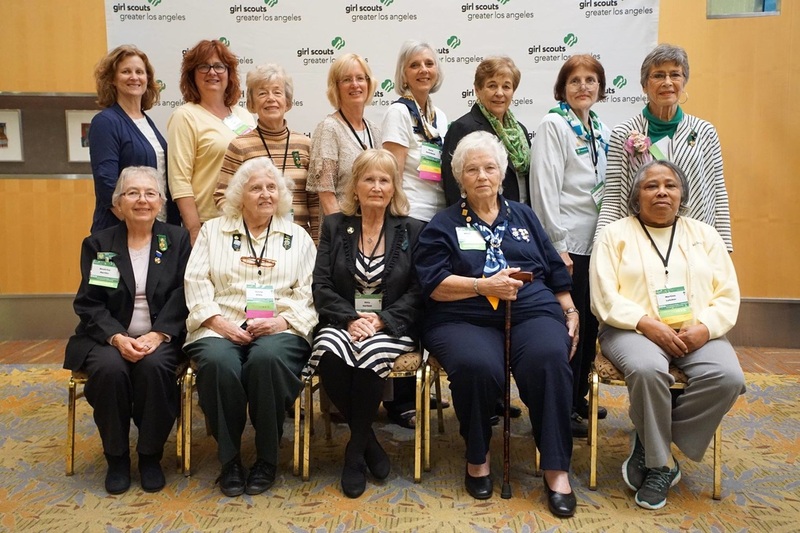 ﻿The Outlook Newspapers is accepting photos of your Girl Scout events. Follow the Guidelines here. The Powerpoint presentation for "2016-2017 What's New for Volunteer Essentials" is available here. ​The updated Volunteer Essentials document can be found here. This is just a reminder to submit your Special Events & Money-Earning Applications EARLY. Applications are submitted online. Click HERE for details. The following Girl Scout volunteers were awarded the Appreciation Pin for their service at the 2016 Annual Meeting and Volunteer Recognition Ceremony: Gail Calhoun, Carmen Ductoc, Aracely Gonzalez, Bertha Olivar, Solange Ramirez, Magnolia Ycasas. ​In addition, Sylvia Wikle was awarded her 80 year pin (Tenure Numeral Guard) and San Marino Service Unit was awarded the President’s Award.